The recently published SIMPLIFY study shows that iodized salt, when it's universally available, provides sufficient iodine to meet the dietary needs of pregnant and breastfeeding women, and weaning infants, with important implications. We've known for some time that universal salt iodization is the most effective strategy to improve the iodine intake in the general population. Thanks to the scale-up of national salt iodization programs, over the past two decades iodine nutrition worldwide has improved remarkably. Is iodized salt enough to cover a wide range of dietary needs? Although the iodine status is improving overall, and school-age children are mostly iodine-sufficient, certain populations remain vulnerable to iodine deficiency. Pregnant and breastfeeding women need more dietary iodine than other adults because some of it is transferred to the developing fetus, and later on to the infant. Prior to our study it was not certain if these higher dietary requirements could be covered by even the most effective salt iodization programs alone. To answer this question, a study entitled “Salt Iodization: Meeting the needs of Pregnancy, Lactation and Infancy” (SIMPLIFY for short) was designed to evaluate whether USI, when it is truly universal, can meet the dietary requirements for iodine in the first 1000 days of life (from conception until 2 years of age) but without causing excess iodine intake in the general population. This multi-center cross-sectional study was conducted in three countries with effective USI programs: Philippines, China, and Croatia by a research team at the Swiss Federal Institute of Technology (ETH Zurich), with support from the Global Alliance for Improved Nutrition (GAIN) and in collaboration with UNICEF and other partners of the Iodine Global Network. We confirmed that USI is effective as the main strategy to prevent iodine deficiency. 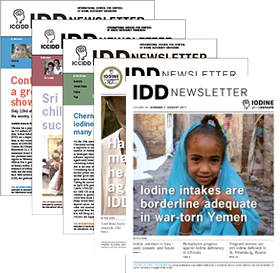 We showed that salt iodized at an adequate level of fortification (∼25 mg/kg), when it makes up a high proportion of the total amount of salt consumed, provides sufficient dietary iodine to ensure adequate iodine nutrition in all population groups: pregnant women, lactating women, and breastfed as well as weaning infants. The risk of excess iodine intake from salt is minimal if it is fortified at the recommended level. When is USI truly universal? 1) sufficient iodine (20–40 mg/kg) is added to all salt for human and animal consumption, including table salt and salt used in food production by manufacturers of processed foods and condiments. 2) more than 90% of households in a country have access to and consume adequately iodized salt (≥15 mg/kg). This goal is based on the assumption that typical salt consumption of 10 g/day fortified with 15 mg of iodine/kg will provide 150 μg of iodine daily. It is generally assumed that the iodine requirements of all population groups are covered in settings where USI has been successfully implemented for ≥2 years, and iodine intakes in school-age children are adequate. Our findings imply that iodine deficiency in women of reproductive age and/or during pregnancy and lactation may be a sign that a national salt iodization program is underperforming, e.g. salt could be under-iodized and/or the coverage of iodized salt could be poor. This highlights the importance of achieving complete iodized salt coverage, as well as having strict quality assurance practices in place to make sure that salt standards are adhered to. The study also stresses the importance of monitoring iodine status in populations at risk in addition to school-age children to identify potential gaps in the USI program delivery. This is especially relevant in countries with incomplete coverage of iodized salt, or where a large proportion of the salt comes from processed foods, and information on the use of iodized salt in food production is missing. Download the study here , or read more about it in the upcoming issue of the IDD Newsletter. Dr. Maria Andersson is a Senior Scientist at the University Children’s Hospital Zurich and Lecturer at the Swiss Federal Institute of Technology (ETH Zurich). She has been a Board Director of the Iodine Global Network since 2012.